Kuala Lumpur (Malaysia), 25 February, 2017 – SRSG Santos Pais has concluded a three day visit to Malaysia with her participation as key note speaker in the national Forum on Violence-free Early Childhood. The Forum was organized by the Early Childhood Care and Education Council of Malaysia and UNICEF and brought together more than 150 policy makers, early childhood educators, academia, parents, caregivers and other key stakeholders in Malaysia to discuss strategies for creating a violence-free environment for young children. In her keynote address, the SRSG stressed that “Ending violence in early childhood is first and foremost a question of children’s rights. Neglect, abuse and ill-treatment can have severe and lasting impact on children’s development and wellbeing. But in addition, inaction can have serious economic costs for society”. "Children experience the most rapid process of growth and development in early childhood and a large body of scientific research shows that the first 1000 days shape their future path in life. When children have a nurturing, caring and protective family environment, they enjoy limitless opportunities for healthy development, enhanced resilience and cognitive skills, as well as more confidence and self-esteem. But exposure to abuse and neglect may irreversibly damage the development of children’s brains, as well as hamper their emotional and physical health, and compromise their learning potential and well-being” said Santos Pais. “The 2030 Sustainable Development Agenda places these critical issues at its heart and includes specific targets on ending all forms of violence against children and ensuring access for all children to quality early childhood development, care and pre-primary education. The clock is ticking towards 2030 and there is no time to lose!" she added. SRSG Santos Pais also participated in a national roundtable on Cybercrimes against Children, especially Cyberbullying, hosted by the Ministry of Women, Family and Community Development. The roundtable brought together government officials, policymakers, academics and ICT industry representatives to review the remarkable opportunities that the increasing access among children to new technologies brings while also highlighting its risks. 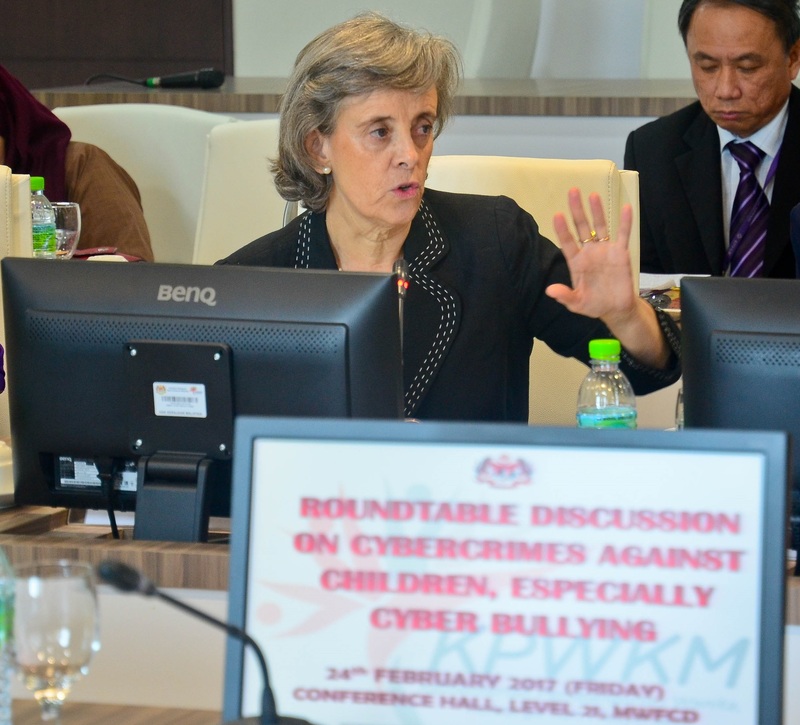 As in many other parts of the world, legislation and policy in Malaysia for the protection of children from online abuse needs to be strengthened to take into account the opportunities and new challenges presented by information and communication technology being used to commit crimes against children, as well as peer-violence such as cyberbullying. The roundtable identified a number of initiatives that are already underway to help to enhance child protection in cyberspace, such as the drafting of new legislation on grooming and other sexual crimes against children, as well pointing out some gaps where further work is needed. During her visit, the SRSG also met with the Human Rights Commission and with civil society organizations who are working to promote and protect children’s rights in Malaysia. In these wide ranging discussions, key child protection concerns were raised including the need to secure the special protection of girls and other children at risk, such as those who are undocumented, affected by migration or asylum seeking processes. The urgency of preventing and responding to harmful practices, such as corporal punishment and child marriage, both through enhanced legislation, capacity building of relevant professionals and information and awareness raising was stressed. Similarly, special emphasis was placed on the promotion of positive parenting and early childhood programmes and approaches to child non-violent discipline. The SRSG recalled that fewer than 80 countries around the world still permit the use of corporal punishment in schools and that more than 50 countries have legislation prohibiting violence against children in all settings, including the home.